Fernando Llorente spoke to the Spanish media after Tottenham’s 2-1 victory over PSV on Tuesday evening, and his comments about a return to Spain have been well covered. The assumption has long been that the striker would finish his period in the Premier League and then return to Athletic Club Bilbao and see out his football days there. The club’s current president Josu Urrutia has previously gone public to play down the possibility, pointing to the fall out when Llorente left the Basque club. Running down his contract before leaving for Juventus on a free transfer, the footballer saw himself ostracised and sent away with the opposite of good wishes. But it won’t Urrutia’s decision, Athletic are currently at the wrong end of La Liga’s table and for now find themselves in a relegation fight. The president has called elections for his position and revealed this week that he won’t be standing in them, which should help Llorente. 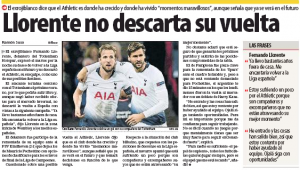 A January rescue act from Llorente would likely be welcomed by many, but it’s unlikely Tottenham would let him go early.